This is an example of a Vernacular house, as evidenced by features from a variety of styles. It is a two-storey, cross-gabled house with a jerkinheaded gable over a one-storey, shed-roofed angled bay on the left. The Arts & Crafts features of the front gable are wide, panelled bargeboards, and an uneven stringcourse which jetties over the wall below. The rear gable has bargeboards with returns; the right gable has no bargeboards. A deep cutaway bracketed bay on the left front has a balcony above. To the left of the bay is a small side entry porch under a flat roof. It has one post and two Tudor arches. The house is shingled in the gables and on the upper floor, and has wide bevelled siding on the main level, with shingles between the water tables. The foundation is brick. According to the Beckwith’s granddaughter Jean Vantreight, the house was for many years stained brown with cream trim. It was converted to four suites in 1956. 1896-1928: John Leander “J.L.” Beckwith (b. Cornwallis, Kings, NS, 1856-1934) was a clerk in a retail drygoods and clothing store at 16. In 1884 he came west and was a travelling salesman for various companies until 1905, then formed J.L. Beckwith & Co. He handled financial business and was a general manufacturers’ agent and importer. In 1903 he and H.C. Brewster, future BC premier, founded Clayouquot Sound Canning Co at the mouth of the Kennedy River, and vied with the Todd family (1041 St Charles St, Rockland) as producers of high grade canned salmon. Beckwith spent many years in public service, as Victoria City Councillor from 1899-1906, Mayor in 1912, and chairman of the Police and License Boards. He was a School Trustee for 14 years until his death. He was instrumental in saving Craigdarroch Castle (1050 Joan Cr, Rockland) from being sold for taxes, and in 1921 helped to establish Victoria College there under the auspices of McGill University. J.L. served as president of the Board of Trade, and as a director of the Chamber of Commerce. He was an early member of the Victoria Automobile Club, Kiwanis Club, BC Agricultural Association, and the Victoria & Island Development Association. During WWI, J.L. worked for Belgian Relief and was decorated by the King of the Belgians. He was grand regent of the Royal Arcanum of Washington and BC. He was also a competitive revolver crack shot and when young, represented Victoria on the Dominion team in Ottawa and at Bisley, England. Agnes Smith (née McLeod, b. Nictaux, Annapolis County, NS, 1861-1927) married J.L. Beckwith in Canard, Kings County, NS, in 1888. A founder of the Victoria YWCA, she was an active worker during WWI with the Florence Nightingale Chapter, IODE, and the Fernwood branch of the Red Cross. The Beckwiths were both very active in First Baptist Church. Agnes died suddenly in Portland, OR, where she had gone for an operation. Beckwith resided in the Willingdon Apartments, then the Pacific Club, until his death. Beckwith St and Park in Saanich are named for him. Growing up in this house, the three Beckwith children staged theatrical productions here, with curtains hung from the arch between the dining room and parlour to create a stage. Macbeth was a favourite of family and friends. All three graduated from McGill: Harold Arthur, a barrister and solicitor, married school teacher Margaret Alice Dunn in 1922.Their daughter Jean married Geoffrey Vantreight of the pioneer Gordon Head family; she provided information on the family. Alfred Edward “Fred” was a British Navy Reserve Surgeon Probationer on HMS Oriole. He died during WWI in August 1918 having volunteered in the hospital in Haslar, ENG, when the flu epidemic hit. He is buried in Haslar. Grace Dean McLeod was a teacher at Victoria High School until her marriage to insurance supervisor Francis Joseph White in 1928. 1929: BC government statistician Hiram Agustus and Ettie Carney. 1930: Plumber Richard Tanner (b. Clevedon, Somerset, ENG, 1874-1955) and Flora Anne (née Hammond, b. Thetford, Norfolk, ENG, 1876-1961) came to Victoria in 1910. 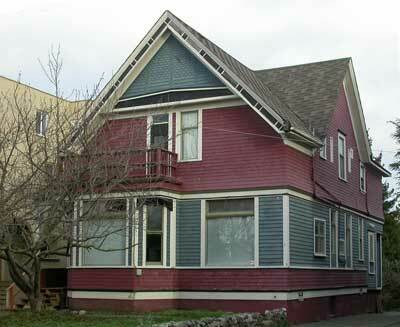 Richard was residing at 1429 Vining St, Fernwood, when he died. 1931-35: Flora Tanner managed it as boarding house, calling it Ferndale. 1936-54: John and May F. Stewart; John had a shoe store at 1613 Douglas St.
1956: Building contractor Leif Sundby (b. Norway, 1907-1956) and Edith (née Aalstad) converted it to four suites the year Leif died. They came to Victoria from Norway in 1952. 1969: Under owner Matthew “Patrick” Paine (b. Victoria, c.1908), a partner in Paine & Townsend, contractors, the house became the Victoria Hostel for Girls. It was then owned by the Fernwood Community Centre, and it became the Fernwood House for their Best Babies prenatal outreach program until 2006. They traded it with Robin Kimpton of Kimpton Realty in Vancouver for 1301-11 Gladstone Av, Fernwood, and with that building developed their very successful Cornerstone project.